Recently, I came across this painting by Francis J. Quirk. Although he ran the Art Department at Lehigh University, there is little information about him or his work despite the fact that he does have a painting in the National Portrait Gallery. Here is where our journey begins with a portrait of Rev. 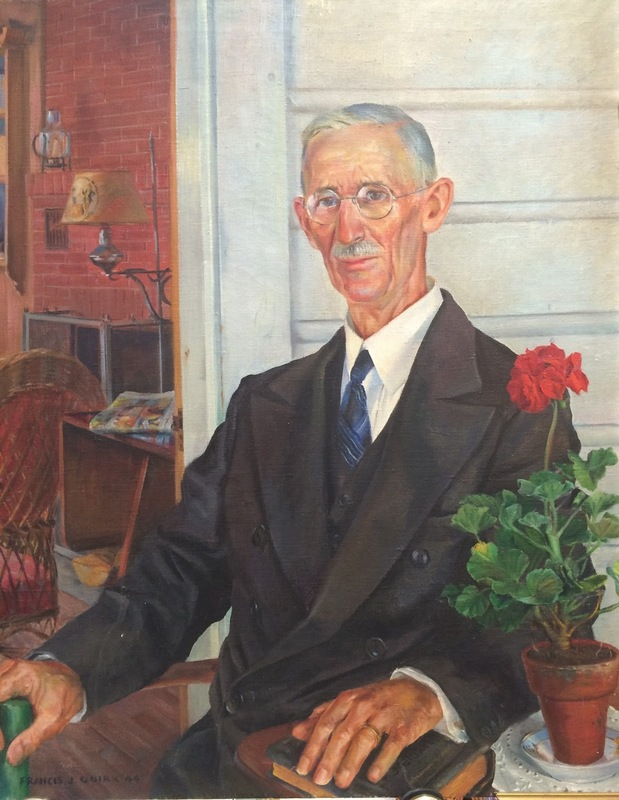 Mark Wakefield painted in 1944 entitled "The Summer Pastor." He adds depth to the painting, by including the room with the drop leaf table on the left side, but does not let it overwhelm the sitter. The painting was once framed and is now getting a new frame for it. is the Reverend's right hand really cropped like this in the painting? I believe so Dusty. The painting is getting framed so I cannot say with 100% certainty. But I don't think my phone camera would have cropped off 3 inches. Does this detract from the painting in your view? Is this a portraiture no-no? The painting is back and the hand is not cropped. I will be posting an image of the framed painting shortly.